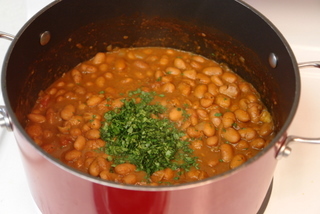 Ecuadorian menestra de porotos is a traditional bean stew dish, made with beans simmered in a sauce of onions, tomatoes, garlic, cumin, chili powder and cilantro or parsley. 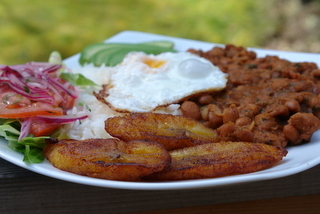 Menestras are popular dishes in Ecuador, they can be made with lentils or beans. They are usually served with rice, plantains, salad and your choice of protein: beef, pork, fish, chicken or an egg (vegetarian option). 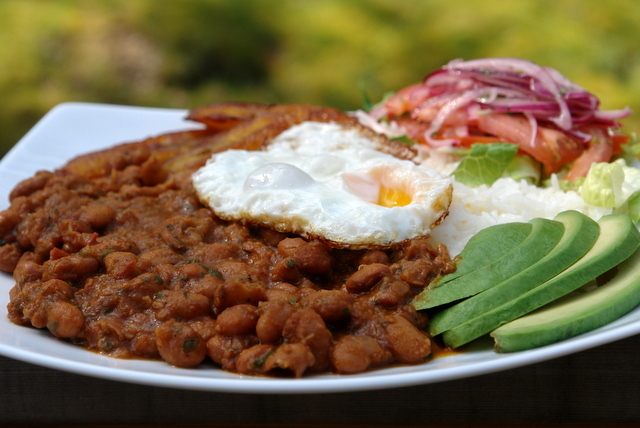 The menestra de lentejas is a common type of menestra that you will find in Ecuador. My mom, with her background in New Mexican food, made menestra de porotos or beans more frequently than menestra de lentejas. She is probably to blame for my intense dislike of canned beans; once you get used to cooking beans from scratch it is really hard to eat bland canned beans. 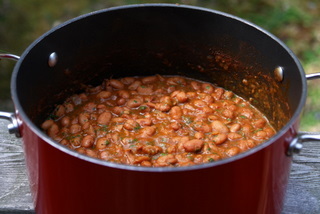 Yes, you can add spices and flavor to canned beans, but it doesn’t compare to homemade cooked beans. 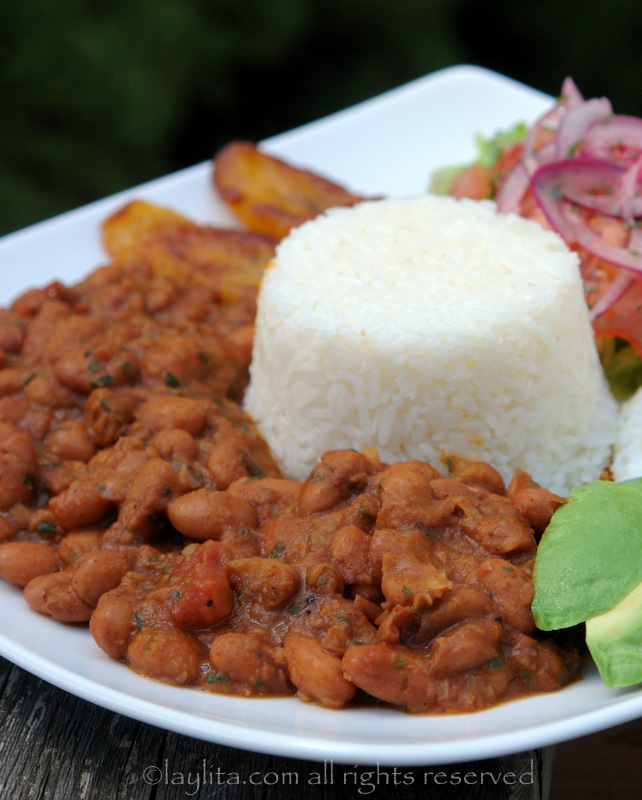 Menestra de porotos is an Ecuadorian bean stew, made with beans simmered in a sauce of onions, tomatoes, garlic, cumin, chili powder and cilantro or parsley. Heat the oil over medium heat in a saucepan or pot, add the diced onions and crushed garlic, let cook for about 2-3 minutes. Add the diced tomatoes, achiote powder, cumin seeds and ground cumin, chili powder, and pepper. Cook for another 5 minutes, stirring occasionally. Add 8 cups of water and bring to a boil. 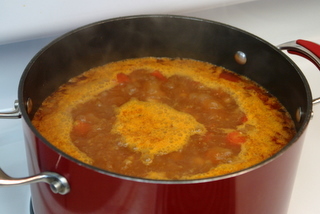 Add the soaked beans and simmer for about 2 hours or until tender. 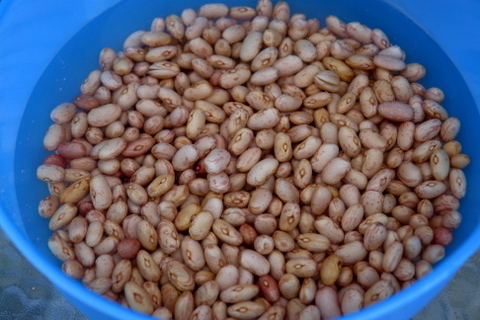 Cooking time for beans depends on the type of beans and their freshness. Add salt to taste, adjust any other seasonings to taste. Mix in the chopped cilantro or parsley. 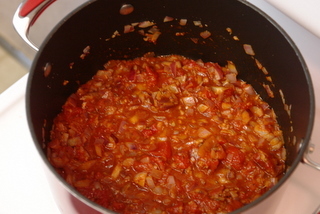 For extra flavor, you can make an additional batch of refrito with onions, garlic, tomatoes, and cumin to add in at this point. 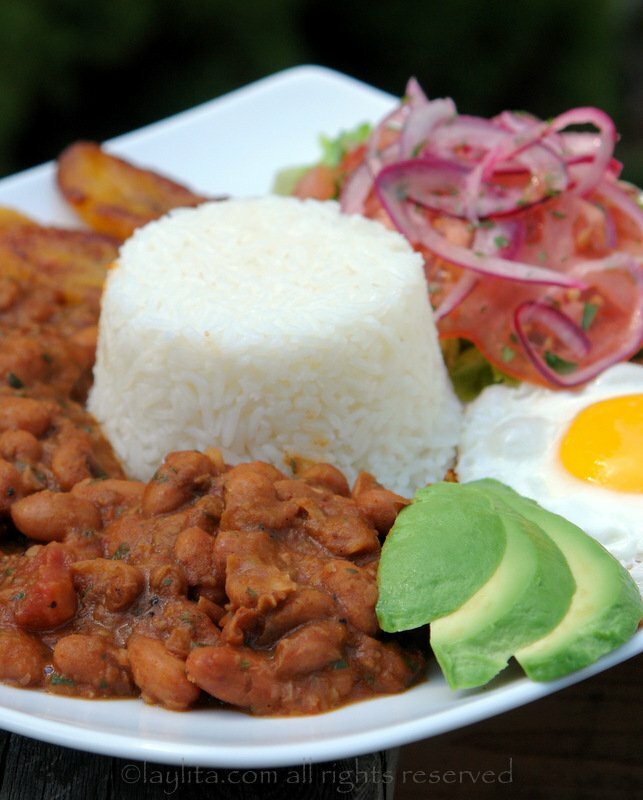 Serve with Ecuadorian style cooked rice, fried plantains, salad with tomato and onion curtido, fried or grilled meat (or fish /poultry/egg), avocado slices and some good aji or hot sauce on the side. In Ecuador you can find a huge variety of beans, I love going to the market and looking at all the different colors of beans. 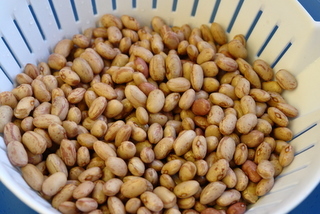 Menestras are usually made with dry beans, however one of my favorite is menestra de porotos tiernos or fresh beans. Fresh beans are harder to find here in the US, though I did see some last summer at the farmer’s market and will try a fresh bean menestra this summer. A menestra would not be a true menestra without the essential side dishes: rice (a must – no substitutions) helps soak up the sauce that the beans simmered in. The fried ripe plantains complement the dish with a nice sweet touch. Some avocado slices and a small side salad, with onion and tomato curtido, add freshness and acidity. Finally, most restaurants will offer you a choice of fried or grilled meat, pork, chicken, or fish, with the menestra. When I was growing up, my mom tried to limit the amount of meat we ate, so it was very common for her to serve this menestra de porotos with a fried egg instead of meat. If you are vegetarian and are ordering this dish at a restaurant you can also request an egg in place of the meat. The beans in the menestra get their flavor from simmering the spices and vegetables that make up the refrito or base of the dish. 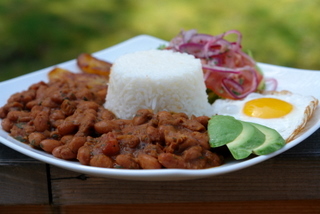 The refrito for this menestra is made with diced red onions, diced tomatoes, crushed garlic, achiote or annatto powder, cumin (both whole and ground, and chili powder; very basic ingredients that add a lot of flavor to the beans. The final touch is the chopped fresh cilantro or parsley that is added at the end. You can also make additional refrito to add at the end for an extra touch of flavor for the menestra. 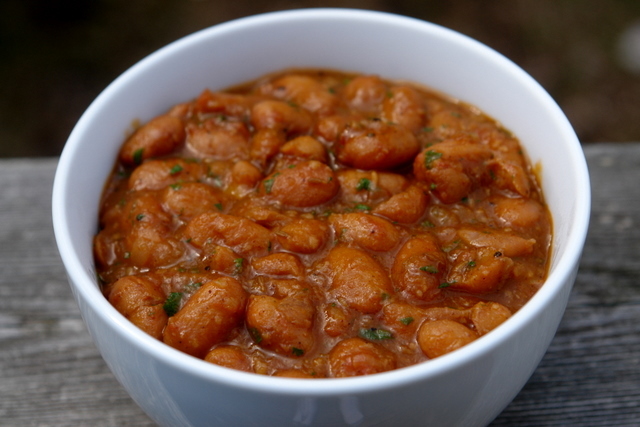 This bean menestra is a very easy dish to make; it takes a couple hours to cook and the beans need to soak overnight, but the preparation is very simple. WOW !!! Laylita, me encanta tus recetas deliciosas y bien ilustradas , lo cual hace mas entretenido el cocinar nuestra comida Ecuatoriana no importa el Pais donde estemos. Ya que cada uno somos embajadores de nuestra cultura y variada comida. Wow, this looks delicious. I’m making this pronto! Thank you for posting this recipe. I made this for dinner last night and it was delicious (and healthy). While the beans were cooking, the aroma in the kitchen was so fragrant. This dish is so easy abd budget-friendly. I will be making this more often. Thanks again! These pictures make me so hungry. 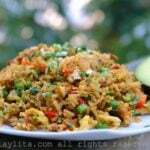 I live in Costa Rica and this dish would be called a casado. 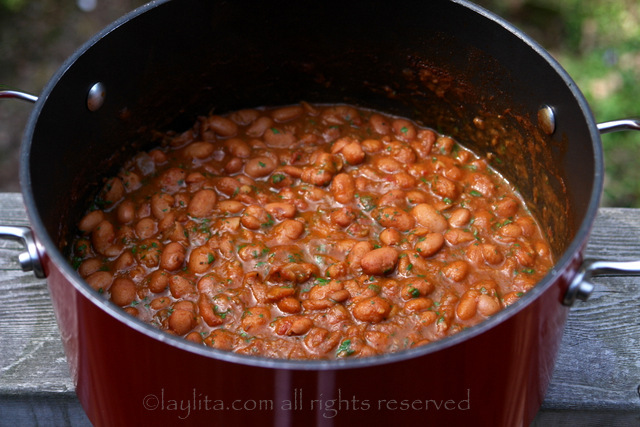 I’m going to try cooking the beans this way, adding the tomatoes is new to me at that stage. I don’t normally use achiote in beans, although I use cumin in chili. I also usually use chicken broth and oregano. Off to the stove now. Yum. This is SO GOOD. My family is Cuban…so normally I stick to frijoles negros, but this was such a nice change! I’m officially hooked! All of your recipes are incredible! Ecuador supports you, do not forget .. that is my food ricaaa Ecuadorian palate’m open to trying different cuisines like Italian, Mexican, Argentina, thailandesa, Japanese, and I love it but for day to day mine will not change by none of mundoooo .. thanks for wanting his own. Just made this last night using black beans and served it with all the trimmings. It was a great meal to end a long day. I having leftovers now and it’s amazing. I just made this recipe with a wailing newborn by my side :) I put in extra cumin since I didn’t have cumin seeds and substituted ground red pepper and oregano since I didn’t have chili powder. I think the flavors were cooked out towards the end so I re-seasoned it. Thanks for sharing this recipe…it’s definitely different and I was looking for a change in pace. Thank you so much…I’m Ecuadorian and don’t no a thing about cooking any of it…just eating it all up when I was there 10 years ago. Thank you. I made this dish…and it’s simply incredible. Thanks. This recipe is amazing. I made a big pot when we went to our family’s lake cabin, and it was an absolute hit. Very easy, and very amazing. Love the web-site. Glad to see you posted something recently! I was worried you were quiting the blogging business. I discovered your website, and I have to tell you I love it. I made the aji criollo, and encurtido everybody really enjoy it. My husband is from Quito, but he has family in Cuenca and love the food from that area, I am looking for the recipe for Sopa de Habas, please let me know if you know how to prepare it. Hi Laylita – thank you for your fantastic site! I’m English but my boyfriend is Ecuadorean and I’ve recently visited Ecuador for the first time since we’ve been together. It was wonderful and the food was delicious… he is a chef and makes a lot of Ecuadorean food but now I’ve found your site, I can make it for him too – which seems to make him very happy! Made menestra, locro de papas and llapingachos so far (I’m vegetarian but these are great)… you’ve inspired me to cook again and I’m going to start working on ‘ceviche de chochos’ next! I have been searching religiously for South American food sites. They are a rare breed. Then I found yours…it is great, but you haven’t posted in a loooooooong time! Are you gone??? Please come back and post some more of these wonderful recipes!!!!! I hope you don’t mind, but I am going to link your ensalada rusa to my post. I found your blog and I think it is absolutely beautiful and your pictures are grand. My best friend is from Ecuador and now I can surprise him with some of your recipes. Laylita-this may be a stupid question but whenever I make this dish or the seco de pollo, I never know if I’m supposed to leave the lid on or off during simmering. What do you do? Thanks! I’m making my shopping list for this recipe right now. I join every other comment on this site and thank you for my return to my childhood. I’m an Ecuadorian living in the UK and am rediscovering all the flavours and recipes from there. Your blog is my first point of reference :D Thanks so much for posting this and keep up the great work! 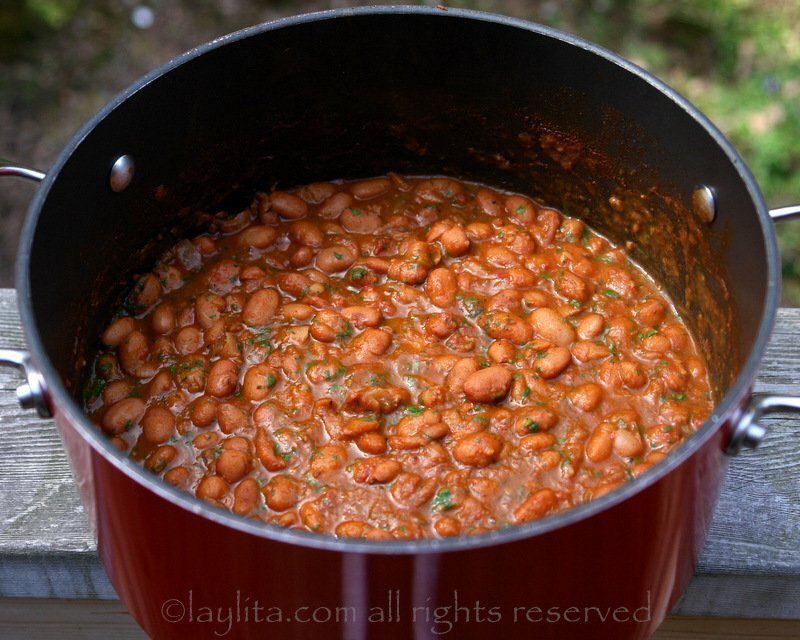 It is very hard to make cooked beans look good and appetizing in a picture, but you have done a fantastic job with this recipe. I will be making menestra this week and look forward to trying yours! May I suggest a couple of variations? When using lentils, I like to add grated green plantain pieces to the simmering pot. It gives it a very nice touch. But my favorite addition has got to be chicharrones, which here in the States I substitute with finely chopped, fully cooked bacon. Just sprinkle it on top of your menestra when plating. Yum! Your blog is beautiful, and this looks AMAZING! I LOVE your website and all my friends, co-workers, and acquaintances know it!!! When the government accidently blocked your site two weeks ago we cried and now I’ve got you back! 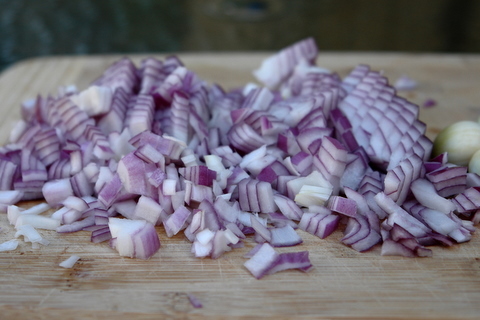 I have started a little collection of clippings from here and have prepared so many of your dishes. My favorite is the shrimp and chorizo rice. Last week I tried making empanadas for the first time EVER! I’m going to have to try it again to get it right on the count of my dough falling apart :). I’ve been eyeing this one for a minute and it’s definitely next.. THANK YOU so much for your lovely website. I just made this tonight, and these are, hands down, the BEST beans I have ever made. And I have tried many recipes, believe me. I served the beans with rice, avocado, the onion/tomato salad and a small piece of fried steak, using your recipes as well. It was such a good meal, and the whole family loved it, including my 2 and 4 year olds! Thank you so much! that looks sooooo good! I love food from around the world. Saw your blog listed on the top 50 mom food bloggers – congrats! 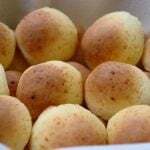 Hi Laylita I just found your blog through Canela and Comino, this is the first recipe I saw and I already want to try it!, I’m Dominican and my husband is Peruvian and I love to cook food from all over the world, can’t wait to learn about your Ecuadorian food ,it looks delicious! Its so sad we havent heard from you. Your recipes are divine. I hope you can come back with more. Me parece un plato muy completo, nutritivo y como se me antojó! Gracias por publicar tantas recetas, todas buenas y qué fotografías! This recipe looks very good. I can’t wait to make it. This looks absolutely amazing. I especially love all the colors on the plate. Hola Lailyta. Espectacular tu bloque de comidas Ecuatorianas, felicitaciones al 100%. Soy del Ecuador y actualmente vivo en Portugal con mi familia,Question? por favor podrias ayudarme con la receta para hacer las longanisas, I will thank you very much!!!!!!!!!! !, Eli. Love your site and the personal anecdotes. I can’t tell if those are pinto beans or something else? I too grew up eating a lot of beans and rice. A complete protein and so good for you. I second Martha’s question, any particular frijoles you recommend? Hi Andrea – You are correct, those are pinto beans. This stew also works well with Brazilian black beans. So cool you are back! and thanks for the menestra recipe…I have found the lentil version everywhere, but not the bean one. Thanks, I will for sure try it. This looks amazing! 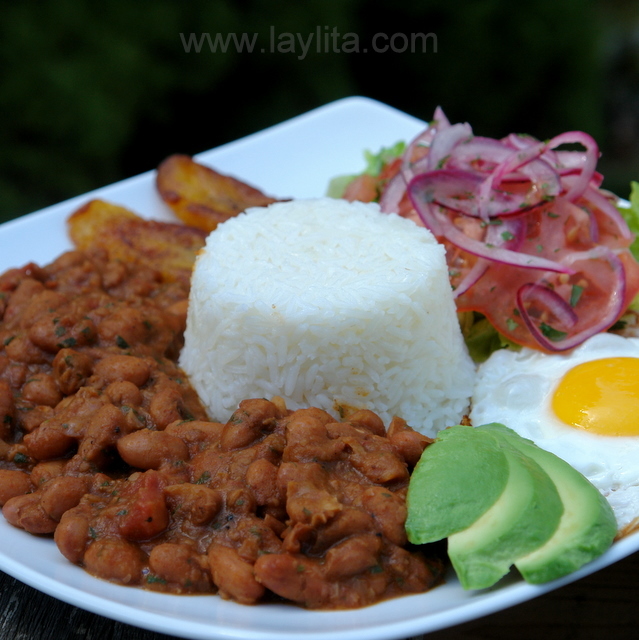 Menestra de lentejas has always been one of my favorites and I can’t wait to try the beans. I was wondering what specific kind of beans would be best to try it with. Thanks for such fabulous recipes! Hon, you have me drooling here… that is such a balanced and fantastic plate of food! Thank you for the great receipes, I am from Ecuador, my children have experienced the great food, I have introduced many friends and extended family to the different dishes and cooking techniques used in Ecuador, we do have great dishes for vegetarians. I have develop a Christmas menu with food from Ecuador only, the 30 people that joins my family during the holidays look forward to Llapigachos, fried plantains (chifles), ceviche de camaron and pernil. A suggestions for the fried plantains, in the North East US, lots of Italian Delis, they sell basket cheese, fantastic when you make empanadas or use on top of the plantains, is a very fresh cheese, it is so light and creamy, very smooth texture, enhancess any dish. Keep up with the great job, and if you need a contributor, I will be very happy to share some of my abuelas y mama recetas. que emocion, voy a comer menestra en Alaska! No se si recuerdas que hice un biche de pescado? Lo prepare una vez mas con salmon. Quedo riquisimo! pero esta vez le agregue harina de platano, y quedo como sango! Gracias por poner mas recetas! Me alegro mucho ver que tienes auspiciantes! I. Have. Got. To. Try. This!!! I am!!! 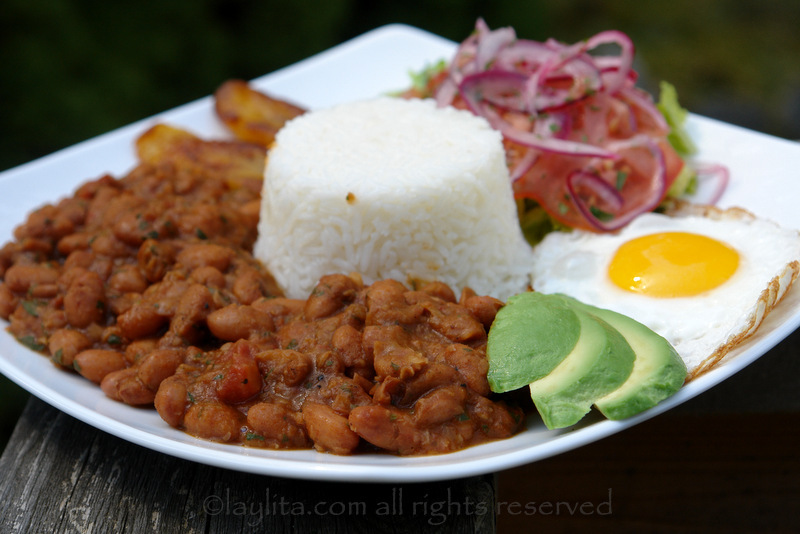 Hi Paz – I used pinto beans, but you can make a menestra with any type of beans. This looks REALLY good… I’m glad to see the new recipes. I go back to Ecuador this coming Wednesday and look forward to the good food I always get while there. That looks really comforting and scrumptious!